Stitch this charming Bargello hearts needlepoint piece to decorate your home. The simple and lovely needlepoint design is perfect for small items to use when entertaining friends, or to give to a special person. The project works up quickly in Long Stitch, with a touch of Hungarian Stitch around the borders. Learn how to work simple Bargello and long stitches with the free stitch diagram that will guide you through the easy needlepoint project. #10 or #13 Mono Needlepoint Canvas - Approximately 12 to 14 inches square. Adjust the canvas size as needed to fit the project you are making, and don't forget to allow for at least 3 inches of additional blank canvas around all sides for final finishing. The completed needlepoint design size for #13 canvas is about 9 inches square. Persian Wool: Choose several colors from your thread stash. The charted design uses off-white, light pink, medium pink, dark pink, light green and medium green. If you don't like these colors, feel free to substitute your own as desired. Colors are important; so you may want to wait until you have mounted the blank canvas and experimented with different colored threads before making your final color choices for stitching. Stretcher Bars: Choose two pairs of stretcher bars in sizes that are the same as the canvas you are using. Mount the canvas with brass or stainless steel thumbtacks after binding or sewing the edges. Assorted Needlepoint Supplies: Assemble the usual needlepoint tool you use when stitching, including tapestry needles, embroidery, and common household scissors, magnification (if needed), proper lighting, frame weight or stand, and related supplies. Although charted for Bargello or long stitches, the pattern can also be worked in continental stitch. It will take a lot of extra time to do so; but if you're not up to learning a faster technique, the tried and true tent stitch is still the way to go. Download, save and print the free needlepoint chart for use while stitching. Enlarge the chart as needed to be able to clearly see the stitches. Using both the stitch diagram and the picture of the completed project, work the stitches over two or more canvas threads to create a Bargello or long stitch pattern. After working the long stitch hearts, make a Hungarian Stitch border as thick as you want to go around the completed needlepoint. Blend two or more shades of wool or use overdyed thread in the tapestry needle to create interesting color combinations. The illustration above shows how the different sections of the design are worked in Bargello or Long Stitch. The border areas are worked in Hungarian stitch. You will notice, that the vertical stitches cover several canvas threads. Refer to this chart as you work the project. 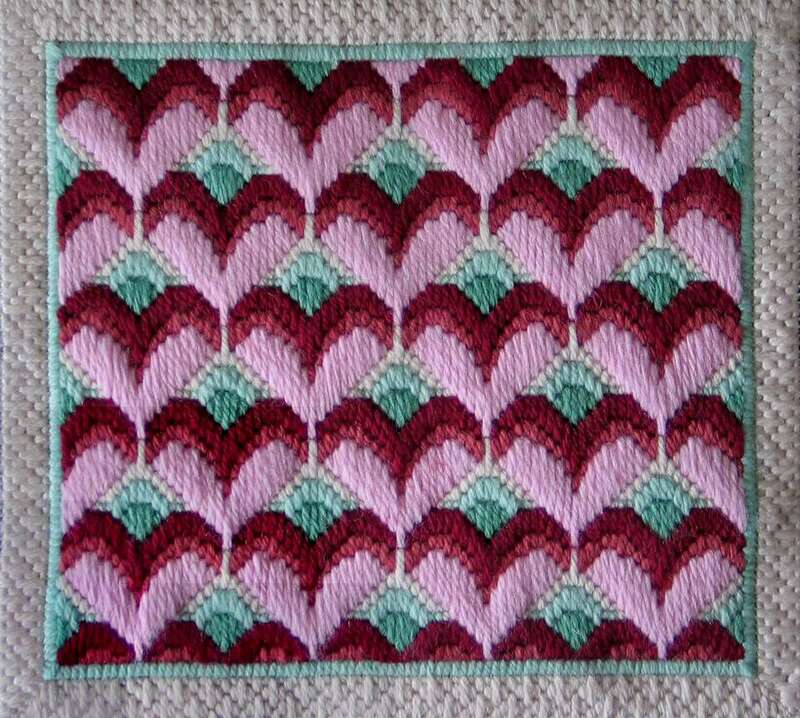 Like most repetitive Bargello needlepoint designs, once you have stitched one or two of the hearts, the rest will easily fall into place. Save this chart to also work the Hungarian Stitch border. Download the stitch detail chart here. After you have tried the Long Stitch, you'll definitely be hooked. Edited by Althea R. DeBrule.